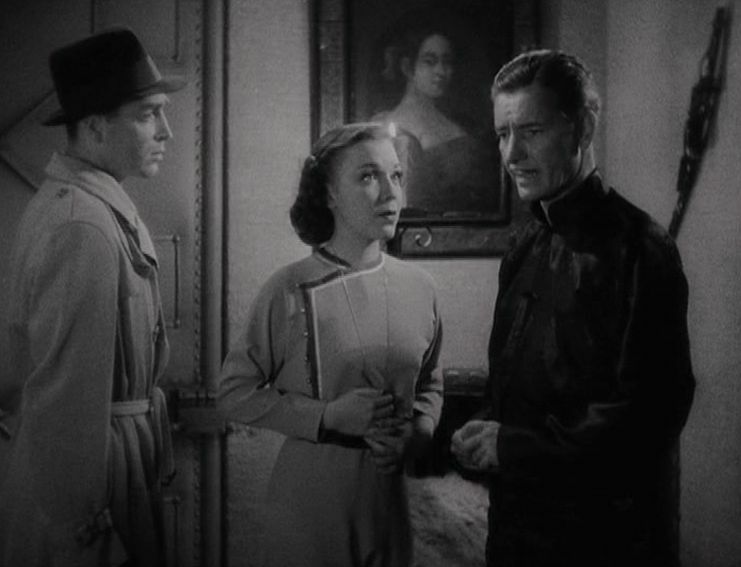 Lost Horizon (1937) is a film that probably everyone should see at some point. Although it is not without some limitations, the film provides an eloquent narrative expression of two key cultural metaphors – the search for the ideal, harmonious society and our all-too-often failures to hold onto the truly miraculous things that we stumble upon in life. The story of the film was based on the best-selling 1933 novel of the same name by James Hilton . It was then fashioned by the popular Hollywood director-screenwriter team of Frank Capra and Robert Riskin into what became a classic. Actually, the film was not immediately a hit and ran into problems early on. The film was set in the Himalayas and had the largest (up to that time) production budget. But Capra overran the budget by a considerable margin. 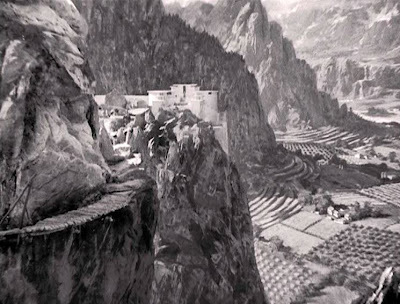 The overruns were not due to expensive location photography – Capra relied on stock footage for many of the Tibetan mountain scenes – but instead was due to Capra’s extensive reshootings of various studio scenes. When he was finished, Capra had a 3½-hour film , a length for which the viewing public of that day was not ready. The film was eventually cut down to 132 minutes, but it was still not a box-office hit early on . The story concerns a small group of people who are brought against their will by serendipity to the obscure, hidden Tibetan kingdom of Shangri-La, where most of the action takes place. This Shangri-La turns out to be an idyllic utopia that we could only dream about, and the term “Shangri-La” entered the popular vocabulary as a term for a mythical paradise . But it is not just a heavenly place that we cherish from watching this story, but the heavenly state of mind that it engenders within the characters who visit this place. This is what makes the story a classic. In fact the famous Latin American novel, Los Pasos Perdidos (The Lost Steps, 1953) by Ajexo Carpentier takes up the same theme in a South American setting and is also a work well worth reading. The story goes through a classic narrative progression of four sections: journey to –> entry –> engage –> departure. Robert Conway (Ronald Colman) – a suave Englishman who is thought soon to be appointed the next British Foreign Secretary. He is evidently also a political scholar and has authored some well-known books on political philosophy. George Conway (John Howard) – Robert’s younger, more emotionally immature brother. Henry Barnard (Thomas Mitchell) – a down-to-earth businessman. Alexander Lovett (Edward Everett Horton) – a stuffy academic paleontologist who has been conducting research in China. Gloria Stone (Isabel Jewell) – a hardened young floozie of uncertain virtue who seems to be terminally ill from consumption. As the flight over China continues, the passengers discover that their plane has been hijacked and is being piloted by a mysterious Asian who has headed the plane not to the safety of Shanghai but to some unknown destination over the western mountains. After a half hour of screen time, the plane eventually crashes high up in the Himalayan mountains, killing the pilot and leaving the passengers shaken but alive. 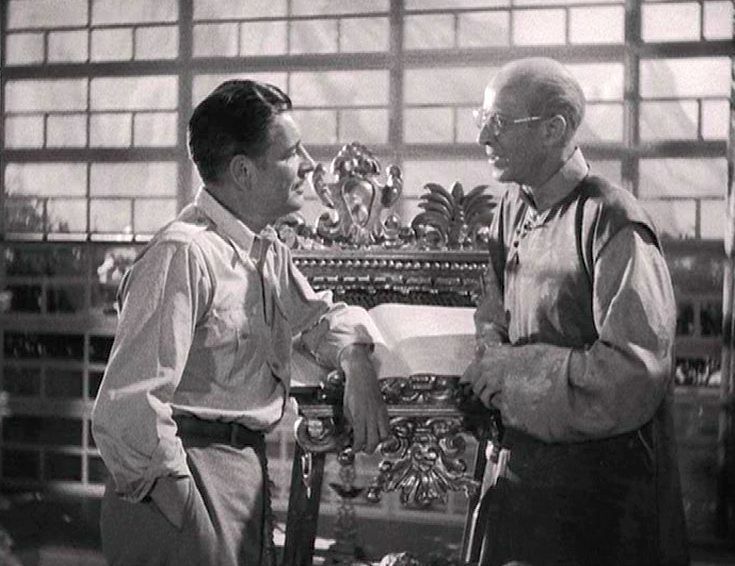 Their prospects of survival in the mountainous wilderness look dim at this point, but they are fortuitously met by a party of Tibetan mountain men headed by a English-speaking Chinaman named Chang (H. B. Warner). Chang leads the five survivors along narrow cliff ledges and over a perilously dangerous mountain pass until they reach a mysterious valley that is bathed in sunlight: Shangri-La. This is the sight of Chang’s monastery, and the entire valley, though essentially inaccessible to the outside world, seems extraordinarily prosperous and civilized. The people there live in complete harmony and want for nothing. There is no acquisitiveness or jealousy, only good will and kindness. As the five survivors wander about Shangri-La, we learn more about both them and their new paradise. Henry Barnard is a man on the run from the US authorities for embezzlement. Alexander Lovett, nicknamed “Lovey” by Barnard, is a pompous professor who seeks to uncover objective knowledge. Barnard, on the other hand, is a pragmatist and a man of skill – he discovers things by direct interaction. Robert Conway is inquisitive and reflective – he wants to learn more about the nature of Shangri-La from the generally taciturn Chang. Robert Conway also meets and is immediately attracted to a beautiful European resident of Shangri-La, Sondra (Jane Wyatt). His impatient and self-centered brother George has no interest in Shangri-La and merely wants to return to “civilization” as quickly as possible, but he, too, becomes attracted to another one of the rare resident Europeans, a pretty Russian girl named Maria (Margo). 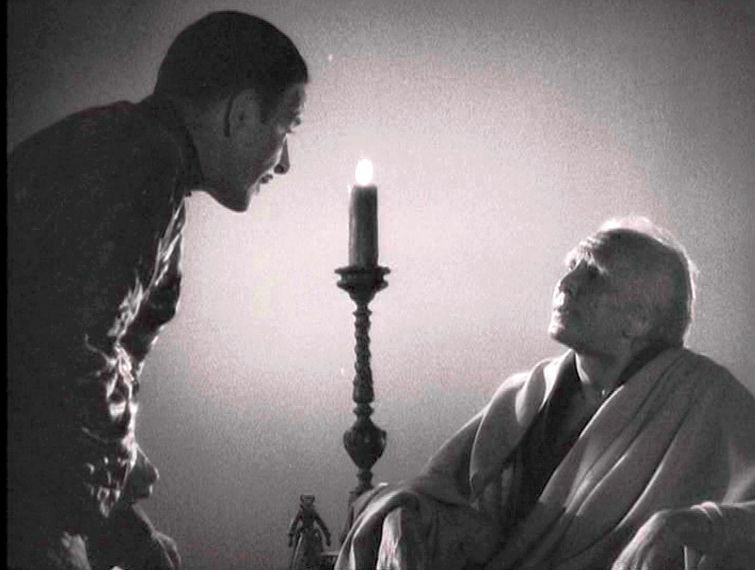 Eventually Robert Conway has an audience with the High Lama of Shangri-La, who turns out to be a former Belgian Catholic priest, Father Perrault (Sam Jaffe), who long ago wandered into the valley and eventually founded the lamasery. Conway is astonished to learn that Father Perrault is more than 250 years old and that the beneficial spiritual atmosphere of their locale greatly retards the aging process. In fact, Perrault tells Conway, Maria, who looks 20, is actually more than 70 years old. But if a youthful-appearing person should happen to leave Shangri-La, Perrault warns, he or she will undergo sudden and dramatic aging. Conway also learns that he and his colleagues were essentially kidnaped and brought to Shangri-La by design. It is Perrault’s and Sondra’s intention to have Robert Conway remain in Shangri-La and eventually assume the duties of the High Lama himself. As he tells this to Robert, Perrault dies peacefully. Meanwhile Henry, Lovey, and Gloria are all getting into the spirit of Shangri-La and are in no haste to leave the place. Indeed the benign environment of Shangri-La seems to have cured Gloria of her terminal ailment. George Conway, though, is determined to get away and take Maria with him. He has arranged for some native porters to guide them out of the area, and he wants his brother to go with him. The two brothers then have an interesting conversation about Shangri-La. Robert tells George about the spiritual wonders of the place and his interest in staying, while George insists that the whole story about virtue and longevity is paranormal rubbish that defies scientific logic and that Perrault was a charlatan. George summons Maria, who scornfully laughs when she hears about Perrault’s assertions concerning her age. She insists to Robert that she clearly really is only 20-years old. Reluctantly, Robert gives in to the hard-headed logic of George’s argument and agrees to leave with them and abandon Sondra. 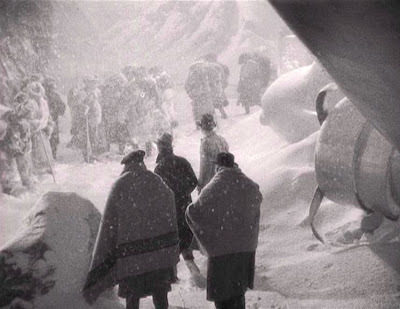 Once away and up in the mountains, Robert, George, and Maria are abandoned by their hired porters and are left on their own in the bitter cold. Maria immediately withers to a 70-year-old woman and dies, spurring the unstable George to commit suicide. 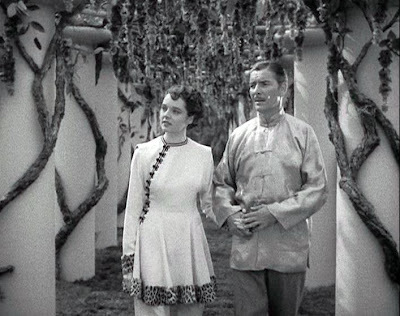 The story of Lost Horizon is a fantasy about paradise found, lost, and the desperate attempts to regain those “lost steps”. As such, the tale fits into the Frank Capra’s Hollywood production values, and much of the production is effective. Ronald Coleman, as Robert Conway, is the perfect protagonist – sensitive, reflective, and idealistic. Capra’s characteristic stock characters, for example “Lovey”, Gloria, and Henry, are, of course, schematic, but their presence makes Coleman’s character that much more believable and worthy of empathy. Unfortunately, Dimitri Tiomkin’s over-the-top musical score is something of a hindrance, but you get used to it after awhile. There are some unexplained puzzles in the story, though, that seem to be gaping holes. If Shangri-La is so physically inaccessible (as is shown in the entry and departure sections of the film), how did those porters manage to bring so many large artifacts to the place, like the grand piano and the huge church bells? If the all-pervasive ethics of Shangri-La are so devoted to selfless humility and kindness, how did Father Perrault and Sondra reconcile their high values with their plan to kidnap all five foreigners (not just Robert) to Shangri-La and subject them to life-threatening risks and violence? Since Maria ages dramatically when she departs from Shangri-La, she must actually have had the age that Father Perrault attributed to her. So why did she lie about her age to Robert Conway if she knew that departure from Shangru-La would return her to a decrepit condition? I doubt these things were explained even in Capra’s 210-minute version of the film, but never mind. These mysteries, I guess, are minor quibbles if the narrative telling manages to get away with them. Nevertheless, I have one further complaint about Capra’s ending to the story. 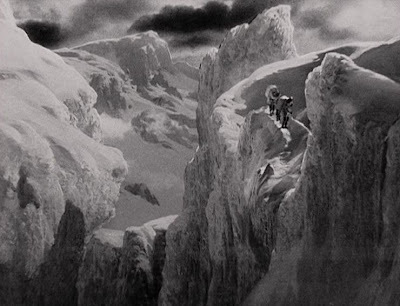 At the very close of the film, the viewer sees Robert Conway up in the mountains still searching for Shangri-La and finally finding that hidden pass into the valley. 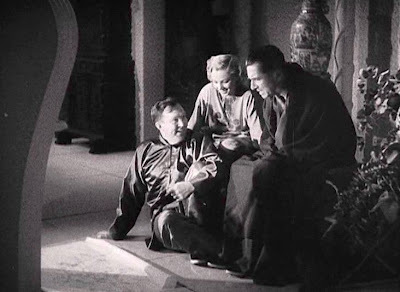 This is Capra’s feel-good ending, but I think it would have been more effective to leave us with the uncertainty about Robert Conway’s ultimate fate. Then we would be faced with what Lord Gainsford in the story faced – the uncertainty that can only be resolved by what we want to believe. James Hilton also authored two other much-loved best-sellers, Good-bye, Mr. Chips (1934) and Random Harvest (1941), which were also quickly turned into big box-office movie hits – Good-bye, Mr. Chips (1939) and Random Harvest (1942). Even so, Capra had a shooting ratio of about 60-to-1 for the film. The film was shot with the then standard nitrate stock, which inevitably deteriorated over time. In addition, later releases, such as 90-minute cut-down versions of the original, led to neglect of some of the original footage. In 1973 the American Film Institute, along with UCLA and Columbia Pictures, launched an extended effort to find extent footage in order restore the original 132-minute version. After 13 years they were able to restore most of it, although some restored elements are of poor quality. I wonder if Ronald Coleman dined on honeydew & drunk the milk of paradise during this shoot.